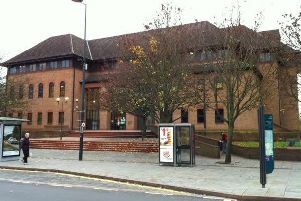 A holidaymaker attacked his partner at a Hope Valley caravan park after he had discovered she had been texting her ex. Karl Gibson, 51, grabbed his partner around the throat during a row at the caravan park, on Station Road, in the Hope Valley, according to a Chesterfield magistrates’ court hearing. Prosecuting solicitor Sarah Haslam told the hearing on August 30: “It was 1am, on August 11, when police were called to the caravan park after a report of a male and a female arguing on the campsite. “Police spoke to campers and it was clear it was a domestic incident with an argument between the defendant and his partner. Mrs Haslam added that the victim would not provide a statement to police and said she did not want to make a complaint. The defendant had blood on him, according to Mrs Haslam, because other campers had intervened and an unknown male had assaulted Gibson. Gibson told police that he had put his hand around his partner’s neck to get her to listen and so he could make his point. He also admitted that he had consumed more alcohol than he would do normally. Gibson pleaded guilty to assault by beating. Defence solicitor Steve Brint said: “They had gone away for a weekend and had been in a relationship for three years and had moved in together. Mr Brint added that Gibson’s partner had begun texting her ex and the defendant became upset and put his hands around her throat but stopped immediately. Lorry driver Gibson had been forced to live in his lorry, according to Mr Brint, after the assault because his bail conditions would not allow him to return to the couple’s home. Mr Brint added that following Gibson’s conviction the couple aims to be reunited at their address on Harecastle Way, in Sandbach, Cheshire. District Judge Andrew Davidson fined Gibson £200 and ordered him to pay a £30 victim surcharge and £85 costs.